Let’s talk about a hot topic of conversation when it comes to pool, men versus women. Throughout my 12 years as a committed competitive female pool player I’ve heard it all & probably had hundreds of conversations on the subject. Non-pool players want to talk about how pool is a game where gender shouldn’t matter & ask why there is a separate women’s professional tour. Others just want to focus on the fact that the best of the men are much better than the best of the women, without looking at the reasons for this or how it might change in the future. Then you have the cocky & chauvinistic guys that have internalized the idea that men are simply better than women at most things. That type has been very lucrative for someone like me, because their pride & underestimation of my female status has helped me take their money, shatter their undeserved ego, and earn a little bit more respect for my gender. Respect that shouldn’t be so hard won. Now that we are in an era of more social equality, it’s very naïve to think that there aren’t plenty of women out there that will & should beat you at pool every time you play them. I’ve been playing regularly since I was 8 years old, longer than most men, which was enough of an edge for me to beat the majority of men in bars since I was 18 (yes I looked older and had a good fake ID =). I want to take the opportunity to share my big picture view on the gender differences in pool. I have spent my lifetime as a woman in a man dominated game and I’ve had a blast. Everyone is entitled to their opinion, mine is based on billiard history, personal experience, research, observation, and listening to others in and out of the pool community. Let’s talk about why there are gender differences in the sport of pool. Since many men already play pool, bringing more women into the game is a key for pool to become more successful. Although we have come along way in gender equality, there are still everyday ways we socialize children. Even from the beginning of life, pink & blue baby rooms, our culture tries to mold us into being more masculine or feminine. Then we buy girls dolls & boys trucks. More often in America little girls are encouraged to dance & little boys are encouraged to compete in sports that are more physical. On average it seems many boys are introduced to their first game of pool between the ages of 10 and 15; however, for girls it may not be until their late teens or early 20’s. The way our culture still places pool into a male category keeps it male dominated. I was raised with sports not dolls. I was encouraged to have a variety of hobbies, including- gymnastics, soccer, basketball, softball, bowling, pool, violin, dancing, singing, cards, and more. It’s time to throw out the pink & blue, dolls & trucks clichés. 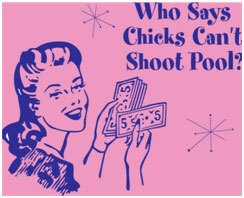 Pool is a great game for everyone, lets teach more little girls and make women feel comfortable in pool halls. When you think about the modern day history of pool compared to other sports/games like golf, tennis and poker, we are relatively young when it comes to mainstream acceptance. This is due to the roots of pool in America starting in smoky bars with gambling. Since pool is a game that you are able to play indoors, and can still perform intoxicated, it makes sense this is where it began. Well there is a new era of American culture and pool has progressed as well! 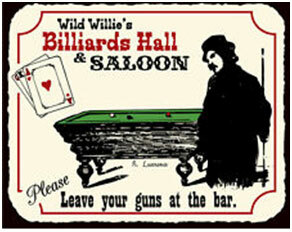 Let us think about the pool hall environment in the 1950’s & 1960’s. Any respectable woman during that time would not feel comfortable in a pool room, nor would they be accepted. The Women’s Professional Billiard Association was founded in 1976 by forward thinking women with the goal to play pool in an arena where they could excel. Essentially woman are now playing catch up to men because men have had continuous assess to pool halls & competition. This contributes to men out numbering women & out playing them. It will be a slow progression, but the scales are moving towards equality. Today there are pool halls all over the country and the world that are smoke free, classy and professional. Places where both genders can feel comfortable playing, learning, and competing. The times are changing for the better and the new generation of women pool players will be stronger than the last. From the standpoint of evolution, psychological testing and skill set based on survival, women multi-task better to run the household effectively while raising kids and men single task to work and bring home food. When it comes to pool there is a lot of information to process at one time, but at the most basic level the most important thing is to make the next shot. In my opinion pool is more natural for men because they keep it simple and are able to concentrate more of their attention on simply pocketing the ball. Women can have an advantage when it comes to the strategy and finesse part of the game, but sometimes they tend to overthink basic situations. In professional competition matches where women play women take more time than men versus men’s matches. This can give the illusion that men are stronger players than women, but it is more stylistic differences. As women continue to catch up, new styles will emerge and the overall level of play by all players will increase. Men and women pool players should learn from each other. Of course only time will tell where pool is headed and how skill, style and numbers will evolve amongst the genders. In my mind’s eye, I see a future of women and men professionals who are equal and play together. Together anything is possible.